From mild December 2015, we have moved into very Chilly and freezing January 2016, brrrrrrr , I am frozen! Britain's weather has taken turn and Sunday morning we woke up to white gardens, winter is here and showing its presence. Every time we open front or back door of the house, freezing cold air makes our bodies numb, which basically makes me want to stay inside our cosy and warm home with my warm and cosy flannel PJs and bathrobe on all the time. Once cold and chilly days are set, my body constantly demands hot and comfort food, so I have been making hot and steamy food to combat sub zero temperatures. One of my comfort food is piping hot and steamy bowl of soup because soup is wonderful this time of the year. Any vegetable soup, so easy to put together, either roast or just throw everything in the pan or pressure cooker, whiz up and mop it down with good rustic bread. 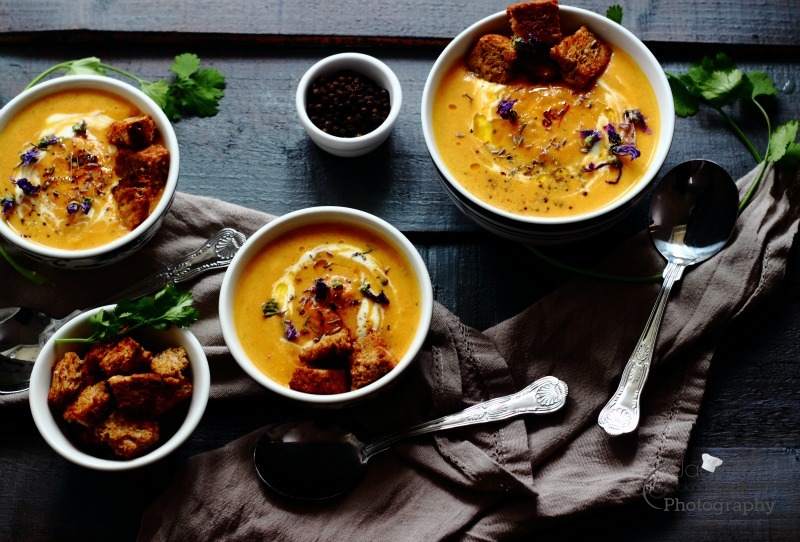 So the day before yesterday it took me less than half an hour from the start of the recipe prep to the time we were sipping this Carrot, Ginger and Coconut soup. It was sweet, spicy, rich and creamy, just right for a cold day. 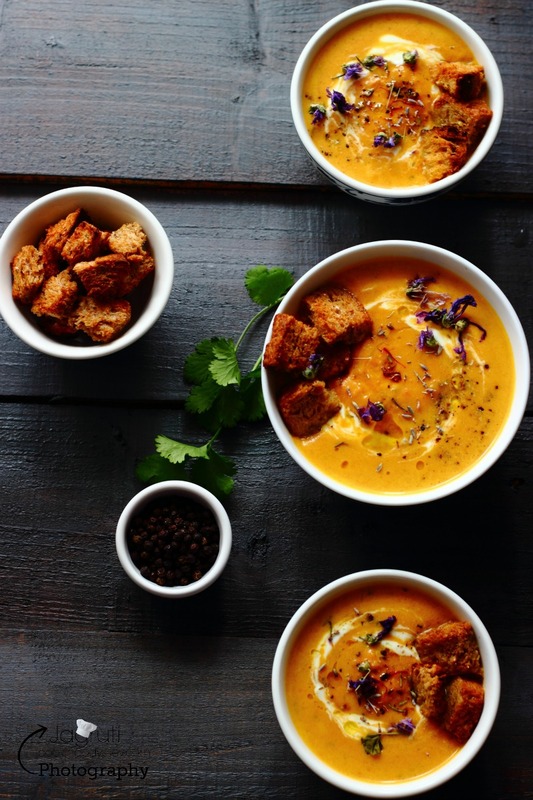 It was just simply amazing, A pinch of saffron gives this soup exquisite flavours. The perfect winter warmer with a smooth and velvety texture, wonderfully healthy and nourishing! Place all the ingredients in a bowl, mix well and leave it aside for later use. Add onion and garlic and sauté till it turns pink. Now add green chilli and ginger. Add chopped carrots, ground coriander, nutmeg and cinnamon powder. Cook everything about 3-4 minutes. Add vegetable stock and mix everything. Once pressure cooker is cooled naturally, add dry saffron, fresh coriander and whizz up with a hand blender or in the food processor until smooth and creamy. Transfer the soup in another pan, add coconut milk ( leave a couple of tea spoon for garnishing) and re heat but not boil. 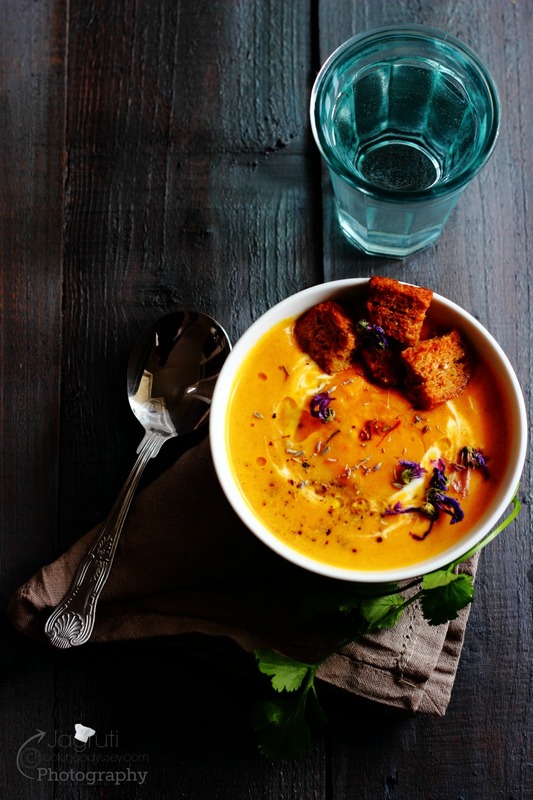 Serve in a serving bowl, drizzle saffron vinaigrette, sprinkle freshly ground black pepper and edible soup flowers. 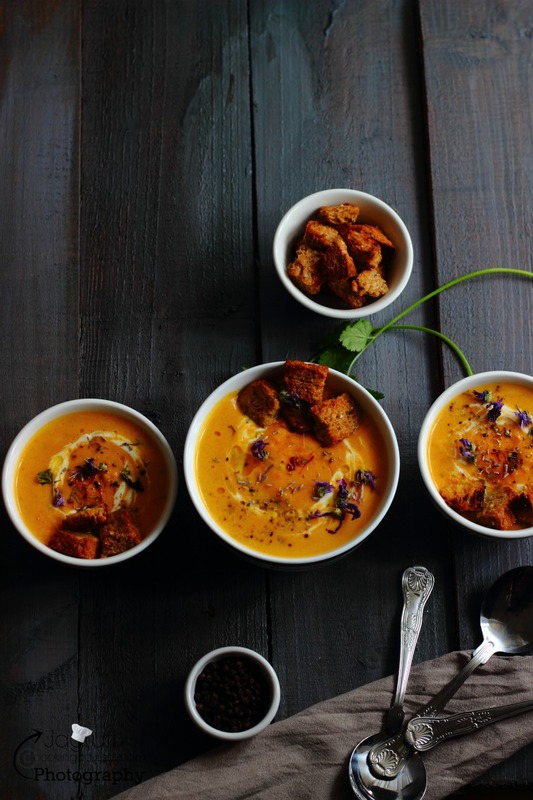 Serve with rustic bread or bread croutons. My family sent me photos of their white gardens or backyards. Looks so pretty but am sure I too would have frozen there. Soup colour looks wonderful, warm and inviting. Great idea to add a bit of saffron for added taste. Lovely combination of flavors and beautifully served!! Perfect for the weather. 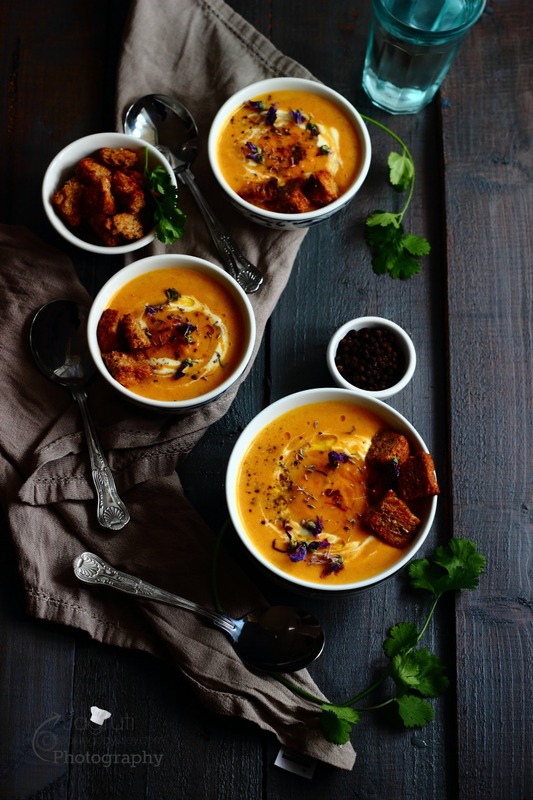 I love carrot soup-this looks warm and cozy. 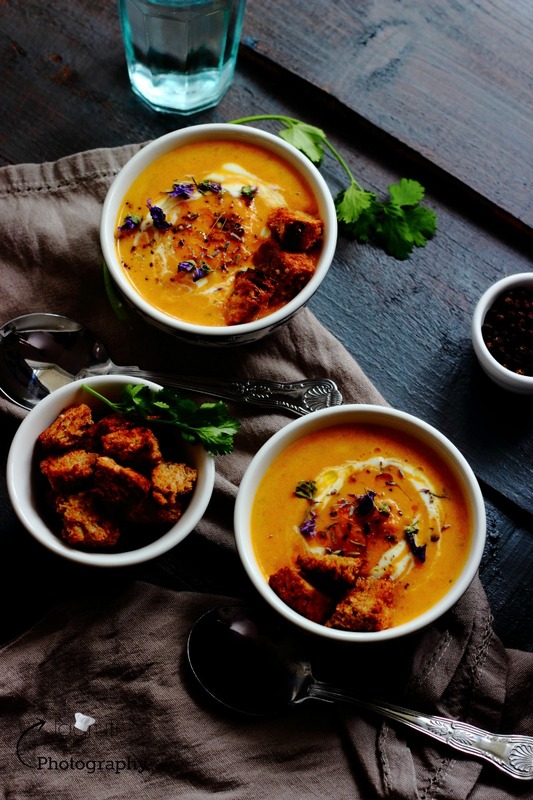 What an elegant and delicious soup! This sounds perfect...I would love this on a chilly night like tonight! What a delicious winter soup! looks like it is packed full of flavour which is always great when you need a comforting soup. Wow this looks so comforting! And I'm obsessed with your photography skills. Well this soup certainly sounds like a great way to warm up! 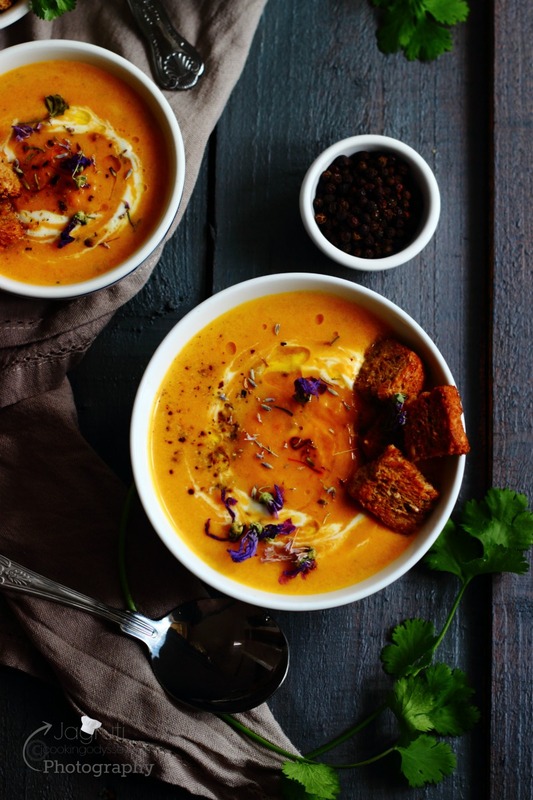 The flavors of carrot and ginger and coconut all go so perfectly together!